Some people like making scrappy quilts with many different prints organized completely at random. Others, like Jenny, would prefer to have their prints match and be carefully pre-planned. 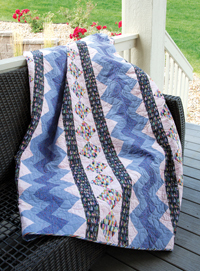 Scrappy quilts are quite appealing for a number of reasons, however, like stash busting, and Jenny shows how a number of prints can be used for a semi-scrappy look with a definite color scheme. She rearranges into a number of different variations for a controlled layout of the scrappy look, then shows how to piece the flying geese together in order to keep the point of the goose. Using solid fabrics, Jenny shows ways that the geese can be reorganized for differing effects.